The application for the 2019 Fellowship is now closed. Thank you to all who applied. If you are a 10th-grader interested in applying for the 2020 Fellowship, please add your name to our interest form. If you are an adult who works with teens, please fill out this form. Every year, twenty-six outstanding North American teenagers are selected as Bronfman Fellows. 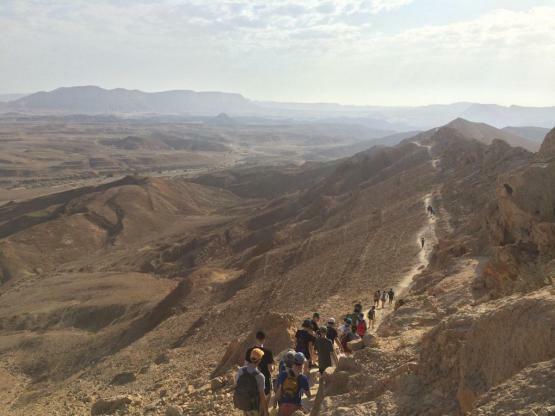 The highlight of the Fellowship is a five-week, all-expenses-paid summer in Israel, where Fellows engage in thought-provoking study and conversation and make lifelong friends. Fellows encounter the land and people of Israel, study major issues in contemporary Jewish life, and meet with some of today's most influential figures. With the guidance of a diverse faculty of Rabbis and educators, the pluralistic group of Fellows have the opportunity to explore a wide range of Jewish texts, from classic religious documents to contemporary Israeli and American voices, using them to spark conversations, engage with stimulating existential questions, and achieve a deeper understanding of themselves and one another. The Fellowship year continues with monthly virtual experiences and a Spring seminar in the United States, usually in the Northeast. Fellows continue their association with the Fellowship through our extraordinarily active, 1200+ alumni community. High school students in the 11th grade who self-identify as Jewish, who are from the United States and Canada, and who will be 16 years old or older by July 1, 2019, are eligible for the 2019 Fellowship. (11th-grade students who are too young can apply in the 12th grade.) Students who are currently in 10th grade will be eligible for the 2020 Fellowship. The Fellowship begins the summer after 11th grade. It covers round-trip transportation between New York and Israel, educational programming, and room, board and travel while in Israel. Room and board at orientation and the Spring Seminar are also included. Limited additional subsidies (based on need) are available to defray costs of travel to interviews, to New York for the summer program, and for follow-up alumni activities. Applications for the 2019 Fellowship are now closed. The application for the 2020 Fellowship will open in early Fall of 2019. Please add your name to our interest form to be notified when the application goes live. Application Deadline for the 2019 Fellowship: November 30, 2018 for the main part of the application. December 7, 2018 for supplementary materials (letters of recommendation and transcript). Dates for the 2020 Fellowship will be announced soon. Two (2) letters of recommendation from individuals who know you well. At least one of these letters must be from a guidance counselor, school principal or teacher. The other can be any non-relative who knows you well (including another school professional, Rabbi, employer, etc.). High school transcript (through grade 10). Listen to the recording of our information session call for prospective applicants, parents, and educators that took place on October 11th, 2018. Our Executive Director Becky Voorwinde, Administrative Director Ava Charne, and two recent fellows (Mira Kittner and Sammy Potter) speak about the application process and our summer curriculum.